They could team-up to fight Swamp Thing’s newest nemesis, the Reverse Swamp Thing. Aside from the fact that this is the…fourth? “Superman Annual #1” to be released by DC over the years, it’s not a bad comic. Swamp Thing confronts Superman about the fact he’s not really from this universe, the harm that’s causing and what must be done to fix it. 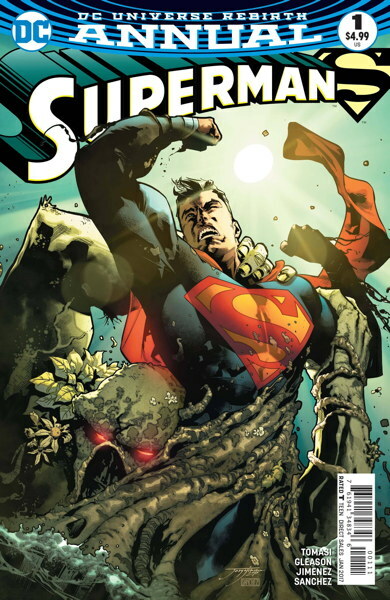 Somewhat reminiscent of DC Comics Presents #85, another story where Swamp Thing has to come to Superman’s aid, only this time Swampy is all up in Superman’s face, as opposed to surreptitiously doing so in that old team-up book. Maybe a little too heavy on the fight scenes, but it does establish Swamp Thing as being able to hold his own against the Man of Steel, which was fun to see. So between this, Swamp Thing appearing in Batman in a month or two, and Swampy’s appearance in Wonder Woman a couple of years back, the old muck-encrusted mockery of a guest-star has completed his tour of the recent versions of the DC Trinity, post-Flashpoint/Rebirth. Now to get him to pop up for brief team-ups in DC’s other superhero books…like, I don’t think he’s been in The Flash ever. Well, the Flash has been in Justice League Dark with him a couple of times, but clearly we need a Flash/Swamp Thing race in the Flash comic itself. Hey, in 2021 it’ll be Swamp Thing’s 50th anniversary. We gotta start planning for this stuff now. Shouldn’t that be “40th” Anniversary? Nope, definitely 50th. Swampy first appeared in 1971!